At the peak of summer freshness serve individual Tomato Melon Feta Salads for a light luncheon or supper side. 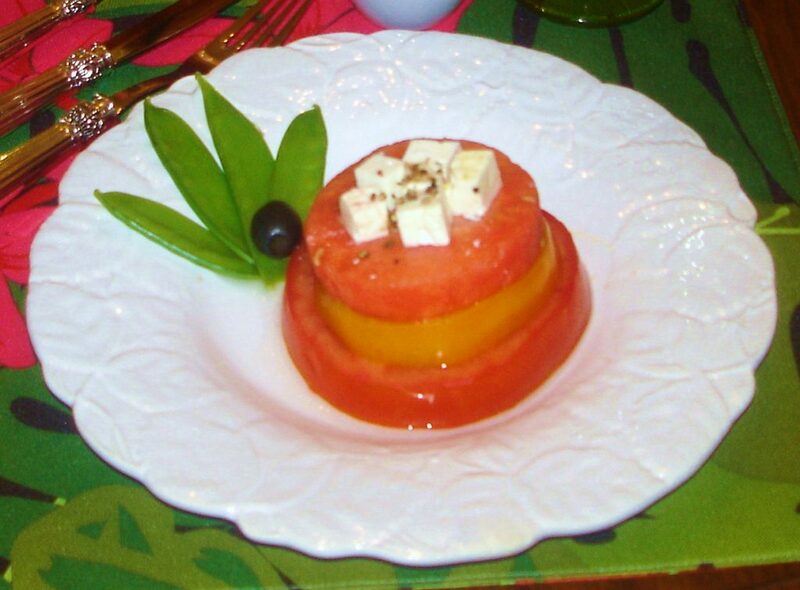 Ripe tomatoes and watermelon slices are layered on individual salad plates with cubed feta cheese and Italian dressing. Crisp snow peas and black olives add a decorative and delicious garnish to this salad. Your family and friends will love the fruit combination and pretty presentation and you will love how easy it is to prepare. See more recipes like this in Sweets & Savories Mini Desserts & Appetizers on shop page. 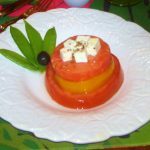 Individual salad servings with stacked ripe tomatoes and watermelon, cubed or crumbled feta cheese that is drizzled with a Balsamic Vinaigrette , steamed pea pods and olives garnish plates with presentation. Easy to make and sweet with tart flavors. Whisk together first 5 ingredients until blended. Gradually whisk in olive oil. Blend well. Store in refrigerator for up to two weeks. Cut melon using round cookie cutter to fit the size of tomato slices. Sandwich watermelon cut round between red and yellow tomato slices so they are stacked. Place on salad plates or large platter. Garnish with feta cubes or crumbles and drizzle with Italian dressing or Balsamic Vinaigrette. Serve with snow peas and olives if desired. To steam peas, bring 2 cups water to a boil. Add snow peas and cook 2 minutes. Remove from heat, drain and immediately immerse peas in bowl of ice water for 2 minutes. Peas will crisp back up and are ready to serve. Salad is impressive to serve and is simple to make. For best results serve salad immediately. Salad can not be made ahead. Cutters can be found here.